With our expertise and trustworthiness, we are engaged in offering an optimum quality range of MIG 250 Welding Machine. Owing to our in-depth domain expertise, we are providing a qualitative range of Welding Equipment. The offered equipment are designed as per industry standards using the best quality basic material under the guidance of our expert team. The entire range is offered in different sizes and designs to fulfill the wide needs of our esteemed clients. In addition to this, clients can avail the provided range of equipment from us at market leading prices. 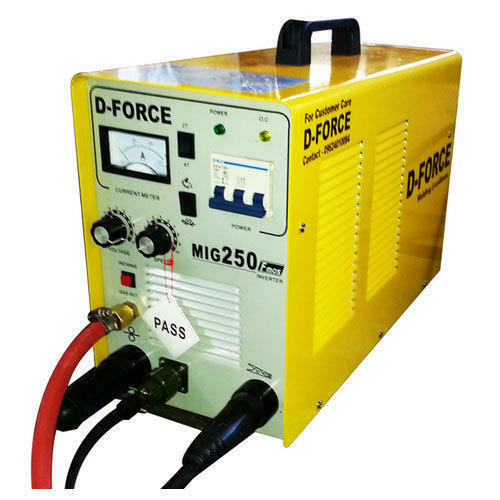 Founded in the year 2013, we “D-Force Welding Excellence(A brand of Diya Enterprise)” are a dependable and famous manufacturer and trader of a broad range of MIG Welding Machine, Wire Feeder, MMA ARC Welding Machine, etc. We are a Sole Proprietorship company, which is located in Ahmedabad (Gujarat, India). We provide these products in diverse specifications to attain the complete satisfaction of the clients. Further, our strong logistic support makes sure that these products are delivered within the promised time-frame. Additionally, we provide Maintenance Service of the offered welding equipment. Under the supervision of “Mr. Mitesh Gajjar” (Proprietor), we have gained huge clientele in our country.